Check out the winners of Sunday’s ATTACK OF THE GIANT CARD!! Tournament! Denis Nadias from Albequerque, New Mexico used his Dark Gouki Deck to earn first place and take home a GIANT Cerulean Sacred Phoenix of Nephthys. 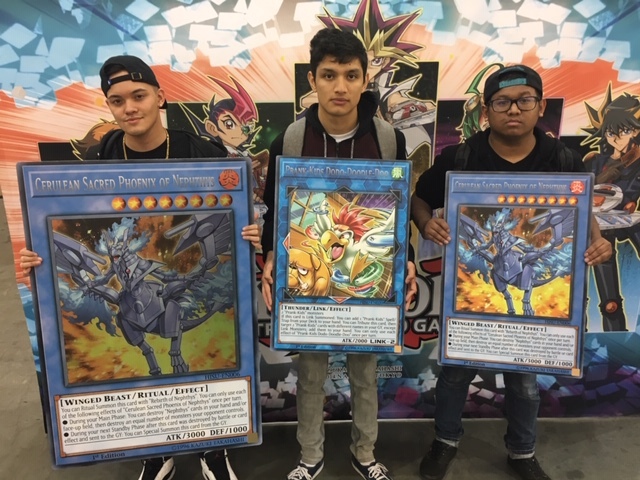 Joining him in the spoils of victory are Andy Hernandez from Redwood City, California and Anthony Lem from Fresno, California who won each won an oversized card of their own!